Mark the end of the day with meditation. Welcome back to episode number five of The Nick Broadhurst Show. I’m your host, Nick Broadhurst. You can catch all of my music at iamnickbroadhurst.com and if you want to see me on Spotify, you can go to iamnickbroadhurst.com/Spotify. And that song was my latest single called Open Wide. It’s actually the title track of my upcoming tour around Australia in January and February; you can get tickets for that at NickandMelissa.com and I’ll be touring with my beautiful wife, Melissa Ambrosini. It’s a real special show. I’ve never seen anything like this, so just very, very excited to get this out to the world at last. And when we first met, our relationship was all about opening. Our entire tour, which we’re doing, is all about opening wide and for me, that was the key to transcending a lot of things which I guess had stuck to me over the years. Things that I have repressed, past hurts, past heart breaks and moving through that, and the key to that was getting into the heart space and opening wide. So, I hope when you hear that song you can definitely get a feeling of that. So very excited to be kicking off episode number five of The Nick Broadhurst Show and I must say that I have really, really loved doing these episodes, and the feedback’s been incredible so far, so thank you so much for all your words of encouragement. I’m glad you’re getting something out of it and that’s all I want, is for you to take something which is new and implement it and hopefully, as I always say, be just a little bit more today than you were yesterday. Today, this is a really good topic today, I’m quite excited about it because there’s bit of an obsession with morning routines, which to be honest, I totally understand, because you want to prime yourself of the day, absolutely. I want to sort of flip that and talk about night time routines because for me personally, I think the night time routine has become even more important than my morning routine. If I don’t get the night time routine, then the morning’s gone, right? So, this episode is called The Power of Having a Night Time Routine, and there’s a famous quote by Benjamin Franklin, who said, “Early to bed, early to rise, makes a man happy, healthy and wise.” And I could not agree more. So, I want to go through three different parts of what I believe are the most low hanging fruit for your night time routine, that we can all improve. They are technology, food and spirituality. So, let’s start with technology because we’re all connected to it, we’re all connect to it right now as you’re listening to this podcast, and we need to find ways in managing this because technology is absolutely one of the most disruptive areas of our life. It’s also very empowering and we get to create and do things we never dreamt of, but we also need to know how to manage it. The first thing I want to say, is when you finish work, you are finished work, it’s that simple; and what Melissa and I like to do, is we like to mark the end of the day with something which is what we call an aura cleanse. Now, if you’re watching on Instagram Live or Facebook I’ll do something really funny. Standing up, you’ll see me do something kind of strange, but we do this little thing called a whoosh, and the whoosh is basically, we do it together and it’s like an energetic shift that marks the end of one thing and a transition into another. So we go like this, whoosh. Slightly embarrassing, but it actually works. So, find a way that you can do an aura cleanse; it might be a swim, it might be a shower, whatever it is, or a bath, use that to switch from work into relaxation. With your work finished that means turn your computer off, like literally, turn it off, don’t close it, actually turn it off, shut it down because when you do that, it does something to your brain. If you can afford to that with your phone as well, even better but at a minimum, put your phone into airplane mode, absolutely. To be honest, our phones should be on airplane mode most of the day, if you can afford it, and certainly my phone is very, very rarely on, as my friends will testify, because they can never call me. But this is the time to wind down, it’s time to get into a more softer, feminine state. It’s time to relax, it’s time to digest, and this also goes for lighting in the house as well, because our lights are, to be quite honest, they kind of poison us. That light tells your body that it’s day time, that it’s midday but it’s not, it’s not, it’s night time, it’s time to soften. So, we actually don’t use any lights in our house other than salt lamps, because salt lamps are more red and we have a couple of kitchen lights which are incandescent, the more traditional lightbulb, and very soft. So think of the night time as soft, feminine, relaxing. One other thing that we do, which has made a huge difference, is wearing BluBlocker sunglasses. You can look at the ones that we wear, they’re called Swannies, you can look at those at melissaambrosini.com/swannies; that’ll take you to the right place, but this basically just helps your body get into a much more relaxed state because you’re not taking in all this artificial light and there’s much more science to it than that, but we won’t go into it today. Try and use Night Shift on your iPhone if you’ve got it, so you have a more orange light on your screen, which is a lot better, and if you have to use your computer, if you absolutely must have it on, then you can get a free app called Flux, I think it’s getflux.com, and that will soften and take the blue light out of your computer. And TV, look, I think TV is amazing for relaxation, I think it’s a really nice tool to be honest, not always but I think sometimes it’s totally cool, but it’s been shown and I mentioned this the other day in a previous episode, that it’s been shown that no more than 45 minutes. In blue zones of the world, these longevity cultures, it’s been studied that more than 45 minutes of TV a day starts to erode levels of happiness. For us, in our code, which is another episode you can look back on, we do 30 minutes, that’s our maximum and it’s enough to wind down and just kind of relax and mark that transition into the evening. The next one is food. Food is a big, big one. I’m not going to talk about what to eat, but we want to talk about when to eat. Now, Buda, Buda had his last meal at midday and he encouraged all of his students to do the same because for him, he felt that attaining greater health was having much longer period before bedtime and your last meal. Now, I think midday is probably a bit extreme these days, obviously, because we’re in a much more stressed state and our adrenal glands need more calories and more nutrition, but we can certainly take a lot of lessons from that. Let’s say we’re going to go to sleep at 9pm, in fact as a general rule, asleep by no later than 10, if you able to do it, depending on your work. Because from 10 to 2, it’s a pitter phase of the evening and this is the phase where the body is cleaning house. It’s digesting and I don’t mean it’s digesting in the stomach, it’s digesting in the small intestine, so we’re not trying to digest food up here, we’re trying to assimilate the nutrients that have already passed through the stomach. We don’t want to go to bed with food in our stomach. We want the stomach to be empty and for the food to be assimilated. Now, if you go to bed with food in your stomach, that’s going to disrupt the detoxification process. Now, this is very scientific stuff and there is a very, very small minority of people who can eat before bed; according to doctor Stephen Cabral, it’s 1% of the population and that just happens to be me, but I still don’t do it because I much prefer to go to bed with an empty stomach. For us, it is bed at 8:30, asleep by 9 o’clock, which means we have to have dinner at 5:30, because we want to have a minimum of three hours between bed and our last meal of the day, and we want the meal to be nice and light. Very simple, three hours before you go to bed, you should be finished eating. The last one I want to talk about is spirituality. Now, for me, I always mark the end of the day with meditation and you can absolutely join me on the daily med, which is a challenge to meditate every day of the year, and for me, today was meditation number 15, I’m doing two a day, so that’s 730 meditations for the year and I would love for you to join me. Meditating at the end of the day just feels beautiful because you are getting into that much softer state, and sometimes I’ll have a shower or a bath before I meditate, because it’s even more soft and I’ve had that aura cleansed before shifting from that work state into that relaxation state. But I think a shower before dinner is really important because it’s telling your body that you’re now in a different state. It’s telling your body that okay, we’re done with the stress, we’re done with the cortisol, now let’s relax, let’s start producing more melatonin and let’s start getting into a more relaxed state for digestion. And there’s some little things you can do; you can diffuse essential oils, which bring a sense of spirituality into your home; you can light a candle, which I have to go and buy a beeswax candle because I want to do more of this. Even just lighting a beeswax candle and just looking at the flame for a few minutes in darkness and just focusing on that flame, is such a powerful relaxant for the nervous system, it’s incredible, it’s an ancient practice which you can try. Even just a few minutes of light yoga before you get into bed is also really powerful, and I don’t mean anything strenuous, just really light, just moving the body and making sure you twist in each direction of the body: side, around, forwards, backwards, and that can be quite powerful as well. The last thing I like to do is, I’ve started doing this recently, I’ve started reading in bed but reading from a paperback, which I haven’t done in years, I’ve been using Kindle and reading fiction. I mean, I always felt guilty reading fiction, like I was wasting my life, but I have found that not only do I get to sleep quicker, I have a better sleep and it’s almost like that creativity, that imagination allows you to go into a more dreamy state; and I don’t know if there’s any science on that, but that’s certainly how it feels to me. When you’re lying in bed, you finished reading, the lights are off, the very last thing you can do it’s a very, very simple meditation practice and it’s just the practice of breathing in for three seconds and breathing out for six. Longer on the out breath, then the in breath, and just do it for a few minutes and what this is going to do, is completely switch your nervous system into a state of relaxation. So there are my tips for a powerful night time routine. You’ll be able to get all of the show notes at iamnickbroadhurst.com/5, and if anyone that you know could benefit from having a night time routine, please do send them this episode, and if you’ve been enjoying The Nick Broadhurst Show so far, I would love it and be so grateful if you could head to iTunes or your favorite podcast app and leave me a five star review, and just tell me what it is, in that review, that you love about the show and by all means, make any suggestions or questions. I am completely at your service and would love to hear from you. Thank you so much for being here, I love you lots, and can’t wait to chat to you soon. 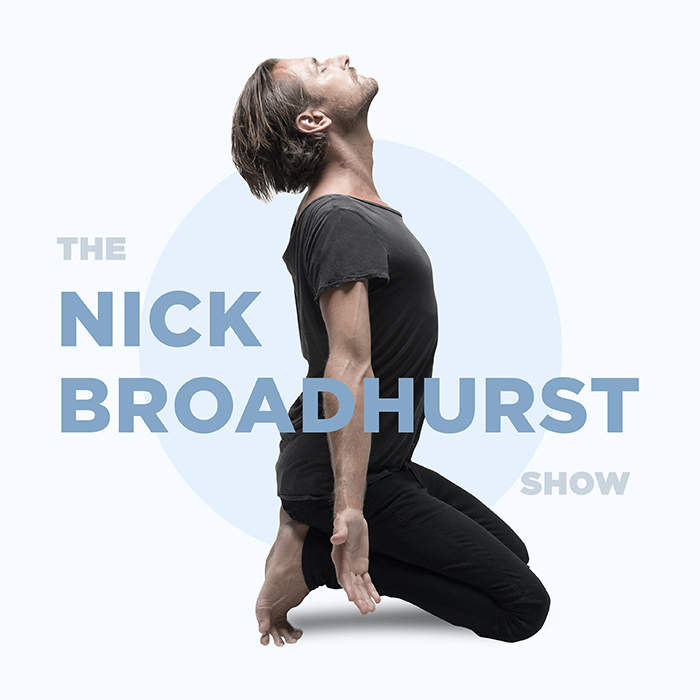 I would love to hear from you, so please tag me @IAmNickBroadhurst on social media, and use the hashtag #TheNickBroadhurstShow, or leave me a comment below ( I read every single one!) Thank you for being here! And as always, listen to your intuition (and maybe your Dr because I have to say that) when implementing any new practice into your life.